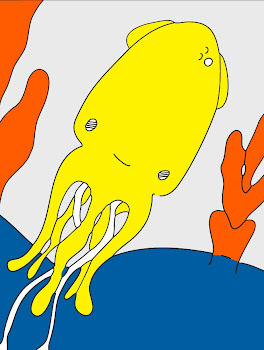 Technicolor Squid: For Lisa If She Would Like. For Lisa If She Would Like. Long story short, in a blur of inspiration, ten paintings also possibly soon to be link buttons “hung” in a link gallery. Lastly, could there maybe a story book here? I may show you a few more of these tomorrow. This one is almost finished it needs touch ups, but it is almost ready to mail to Lisa if she would like it. She may take one look at it and say “no. you keep it.” I doubt that though because she is just so much sweetness! Unfortunately this had to be redone and did not turn out as great as the first attempt. I may have to redo it later. I apologize for the horrible photo. 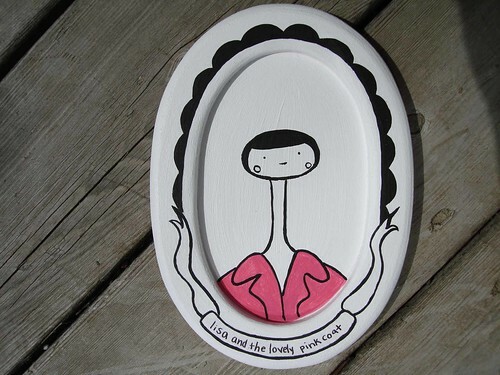 Would be all to pleased to know if you would want to read a story about “lisa and the lovely pink coat”?